Jane Eyre (A Stepping Stone Book(TM)) (Paperback) | Let's Play Books! 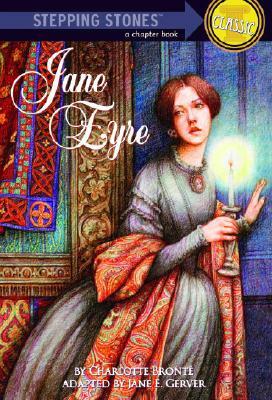 Orphaned at an early age, Jane Eyre, leads a lonely life until she finds a position as a governess at Thornfield Hall. There she meets the mysterious Mr. Rochester and sees a ghostly woman who roams the halls at night. What is the sinister secret that threatens Jane and her new found happiness? Step into Classics(TM) adaptations feature easy-to-read texts, big type, and short chapters that are ideal for reluctant readers and kids not yet ready to tackle original classics. Diane Johnson is the author of many books, including the bestselling novel Le Divorce, which was a 1997 National Book Award finalist, and Le Mariage.